If you are in a hurry, click one of the names above. Every important fact is already there in brief, and you might find some fun and weird truths that are not dished out within the 'scientific' biography. Oda Nobuhide stayed with his other kids, wife and concubines at Suemori castle. Click here for pictures of Furuwatari, Nagoya, where Oda Nobunaga was born. Do you know that there was another warlord in Japan whose name was also NOBUNAGA? Oda Nobuhide, a 24 years-old samurai, vassal of the Shiba clan of Kiyosu, Owari (in Aichi Prefecture today), got his second son. He named the kid something else, but the rest of the world now calls this baby boy ODA NOBUNAGA. The prospects the kid had weren't very yummy. He's the second son, to begin with, and the older half-brother wasn't in a dire need of major repair in the head or something as disabling as that, to be an heir, unless of course what people had been saying was true, i.e. he's illegitimate. If so, according to the Japanese customs Oda Nobunaga was the undisputed heir because his mom was Nobuhide's official wife (that's why this Lady Oda could just resume her merry days (if those were) by delegating the primal motherhood chores to Ikeda Shonyu's mother -- who took care of Oda Nobunaga as a wet nurse and babysitter). He would even be the 'first son' and his older brother Oda Nobuhiro must address him as 'big bro'. Other things that stood in Oda Nobunaga's way as early as the first hour of his life were Oda Nobuhide's rather severely limited territory, his unvaried habits in wars, his army management that relied too much on fate, and the yawning schism within the overall Oda clan itself. There were two Oda families in Owari at the time. Oda Nobunaga was born into the much smaller of the two, the 'Kiyosu Odas'. His Odas were not lower in political rank compared to the 'Iwakura Odas' (that's the other branch of the clan), but in real-life powergame there was nothing you could do with just two districts out of ten while your rival held the eight. Considering the slapdash kind of army that Oda Nobuhide got from his dad, Oda Nobusada, and which he never really improved, even if there be a war between the two branches now they would nearly certain to lose. Maybe that's why Oda Nobuhide was content with sneering at the Iwakura Odas and seemed to intend to do nothing unpleasanter toward that direction. For Oda Nobunaga's infant name, titles, appelations, etc., click away to Oda's popular profile at another page. Click it for pictures of Toyotomi, his family, his Captains, and his experiences while working for Oda Nobunaga. TOYOTOMI HIDEYOSHI was born to a female rural laborer (it's not my fault that her name is unknown -- nobody even knew it in Toyotomi's times) in Nakamura village, which was a part of the territory belonging to Oda Nobunaga's daddy. He's the first son, but already had at least one older sister, and would get younger ones rapidly soon. She said the father of the kid was an infantryman named Kinoshita Yaemon, who unfortunately couldn't validate or invalidate the said fact because he had been pretty much R.I.P. Nonetheless, the kid was, so the mother insisted, a samurai. Only a few believed so (and Tokugawa Ieyasu -- who by now wasn't even born yet -- never would). But at least Toyotomi's aunt did marry a soldier, according to Toyotomi's biographers. The name mentioned was Kato Danjo, who worked for the Oda clan -- but 'kato danjo' was a job, not a person's name. Click here for pictures of personal hangout places of Toyotomi Hideyoshi, including a favorite joint where he, Maeda Toshiie & Ikeda Shonyu used to hang out together at. Oda Nobunaga went to war for the first time after his seventh birthday. It was against Tokugawa Ieyasu's Matsudaira clan of Mikawa. There is no record of him cutting anybody's head this year yet -- but he, according to existing files of the clan, did some real fightings there. Back from the battlefield, Oda Nobunaga declared himself an 'adult' and from then on the entire Nagoya castle was his domain for real. Hirate Masahide disagreed with it, but Oda Nobuhide was never around to get sufficiently dissatisfied with Nobunaga's re-assessment of his own status. Toyotomi Hideyoshi's status was also re-assessed, but not to his advantage at all. His mom somehow had managed to get him a step-father. According to his biographers the man was another low-ranked infantryman of Oda Nobuhide's army named Chikuami, and he was too much alive to Toyotomi's liking. The man was an alcoholic. Oda Nobuhide did what he always did this year, i.e. warring to the left and to the right against the same old foes every day any year. Right now he was very busy with his routine of battling the Imagawa clan of Suruga and the Saito clan of Mino. Since Oda Nobuhide very seldom saw Nobunaga, the kid grew up virtually all by himself. Oda Nobuhide had delegated his headache in Nobunaga-rearing to his advisor Hirate Masahide -- whose job description (as this branch of Oda clan's Public Relations and Liaisons Officer, or 'nakatsukasa' in Japanese) actually never comprised of underage kids-tutoring. Oda Nobunaga was 8 years old now, and had resumed proprietorship of the title of 'master of the house' a year ago; he never listened to Hirate then, let alone now. But personally this year Oda Nobuhide looked like doing good in battles. One of them, at Azukizaka, would even get remembered by a scanty number of historians in 21st century, because there Nobuhide somehow managed to whack Imagawa Yoshimoto's army in technical knockout (for the time being). But he didn't do any carving of immortality in the ones against Saito Dosan's army. Instead, he even lost Nobunaga's uncle Oda Nobuyasu. Meanwhile, the 6 years-old Toyotomi Hideyoshi had already been expelled from a number of rural part-time jobs. People said the funny-looking village urchin -- whom they already shouted at as 'Monkey' -- would either die of starvation or lean toward criminal professions. 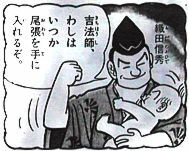 The rice-maker of the by now swelling household in Nakamura was still Toyotomi's mom, because in Japan field jobs were women's, and, as degraded as her new husband was (he's just predictably dropped-out of the Oda army because of perpetual hangover), a samurai wasn't born to make money. TOKUGAWA IEYASU was born, only you can't call him with that name yet. His dad, Matsudaira Hirotada, Lord of Okazaki in Mikawa, was only 17 years old this year, and his career seemed to have been fixedly to fight against Oda Nobunaga's father, the Saitos, the Imagawas, and so on, the same as the Oda clan's enemies, since their territories were all kind of clotting in one same slice of Japan. The Matsudairas were just as small as the Odas of Nobuhide's, and it was scarred all over by internal quarrels, although none of it involved questions about the next Chief of the clan -- the title was securely Ieyasu's from the beginning. Click here for pictures of Tokugawa Ieyasu's places, including where he was held as hostage since age 5. Oda's daddy still fought on. This year he got luck by his side; Tokugawa Ieyasu's dad had to concede victory to him around the borders. The mercilessly redundant battles of Oda Nobunaga's father versus Tokugawa Ieyasu's dad is so severely boring no matter where you look at it from; sometimes Oda Nobuhide won, sometimes the Matsudairas did, over and over to no end these years. Oda Nobunaga at 5 years old according to the official guidebook of Gifu museum. In this picture, he was trying to skip sedentary lessons. Oda Nobuhide is said to be strict in forcing Nobunaga to learn ABC's in order to balance the kid's mastery of the skills he would need later. But he wasn't there to apply this principle in daily lessons, so Hirate Masahide really was in trouble for the "teach that kid some discipline!" fell on him, too. Nobunaga's interests were already swaying too much into fencing and karate. Contrary to bookish activities that must be forced on him, Oda Nobunaga never needed any instruction to learn martial arts and riding. Oda Nobuhide got beaten up by Saito Dosan in the battle of Kanoguchi. He never did good lately, and didn't feel good either, often complained of some indescribable pain somewhere around unementionable territories. From Nagoya, Oda Nobunaga observed his dad's battles critically and started to build his own in his mind, since there was no way for him to actually overhaul the real and existing army yet. Toyotomi Hideyoshi also did his own observation of Oda Nobuhide's army -- or, more precisely, Oda Nobuhide's soldiers that he often saw in the streets. His interest toward this unlikely direction exhausted everyone's patience; his step-father sent him to a monastery. That's a common punishment those days when you belonged to the category of kids who wouldn't get a year-end gift from Santa Claus.